THE COLOR BOOK. Copyright © 2013 by Sophie Benini. Translated from the original Italian by Guido Lagomarsino and edited by Gita Wolf. 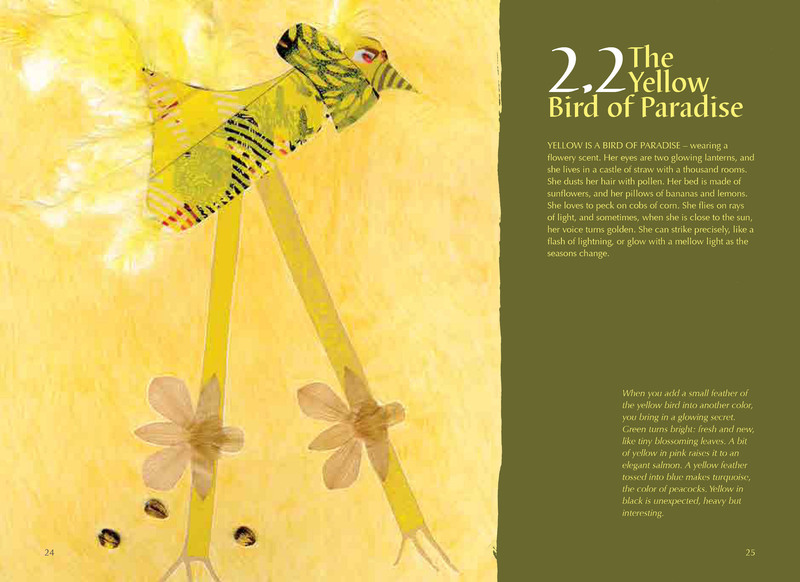 Images reproduced by permission of the publisher, Tara Books, UK and India. My daughter, who turned ten years old this week, is having a birthday party sleep-over, so needless to say, I can hardly focus now. (Our house is tiny. It’s LOUD.) Consider it a minor miracle if anything I typed above makes any sense whatsoever, so I’ll forego kicks this week, except to say I’m extra grateful to have had the pleasure of my daughter’s company for ten whole years now. 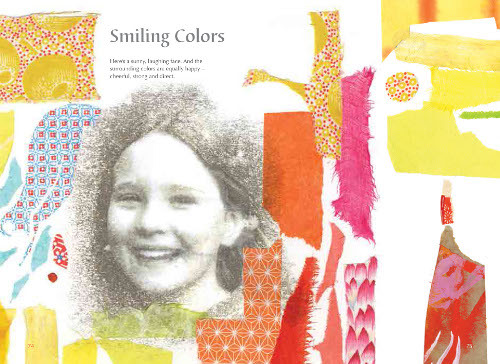 Love the collages for The Color Book, and so happy that the talented Kate Berube has signed with an agent! Early this week as I have an early morning tomorrow. 1) Cut the grass for the first time this year – yay spring! 2) Date night. It was great. That is all. 3) Finally painted my hallway this weekend – very happy with the finished result – color is Platinum Band – totally works with my color palette. 4) Beer, pizza, and a friend to help me paint. 5) Lobster mashed potatoes from date night dinner. Heaven. 6) Tv show Parenthood. Love it even though it makes me cry. I will be adding The Color Book to my next order. I already have a couple of people in mind who will love this book. Thanks to Sophie and Jules for sharing. The noise of a house filled with a ten-year-old birthday celebration sounds wonderful. Hope all was glorious. 1. My Mom is getting better. 2. More snow to cover up all the brown landscape. Can’t wait to read The Color Book–what polychromatic effulgence! I turned 40 on March 10, and aside from the sudden urge to bellow at the crescent moon, I’m taking it well. Thanks for sharing The Color Book. We need more of these. And congrats to Kate for signing an agent. Jules, enjoy the festivities of 10 YO invading your home. How fun. Rachel, it’s been a wonderful few days in Ptown hasn’t it? We need to mow the lawn too. Margie, the full mon at midnight and snow, bet it was lovely. 1. Oldest grandgirl is here for the weekend. 2. We saw a production of Alladin last night. Fun! One of my students was in it. 4. I’ve written everyday for 15 days in the Slice of Life Story Challenge. 5. Typing student poems from the author visit. 7. Tomorrow is the beginning of the March Madness Poetry tournament. I will have 48 hours to write a poem and then get votes. Yay for loud 10-year-old sleepovers and the brave mamas who host them! And yay for colors and Sophie and Kate! Love their work! Pretty colors, Sophie! Thank you for sharing. Good morning, Imps! Happy mid-March to you all. Jules: Happy birthday to your decade daughter! Margie: Glad that your mom is improving. Jone: Kudos for the ongoing writing and reading. 2) …the other was a modern-day workplace comedy inspired by The Office and Mindy Kaling. 4) Filming on location with a lovely fictional family. The film is now wrapped. 6) A monologue I wrote was selected for performance (I’m not performing it; it’s on the opposite coast) and the project is raising funds for a very worthy cause! That looks like a fabulous book by Sophie. Will admit to being more than slightly bowled over by the blown-up two-page spreads, especially when I saw the page numbers at the bottom of one spread: 132 + 133. WHOA: a big book, huh??? 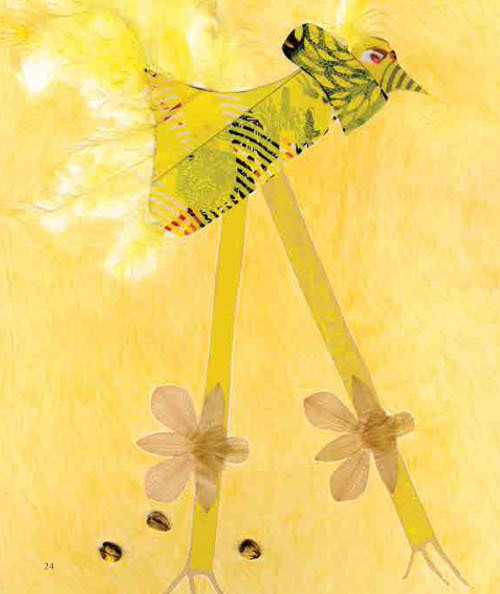 Really liked both the little story and the gentle look of Kate’s work, too. 3. Prospect of big phone-upgrade day. 4. Impending big-travel days (in a couple weeks) (not really big in terms of distance or exoticness, just ‘home’ to NJ to visit family). 5. Chinese — even ‘Chinese,’ in quotes — takeout. Mmmmmm. 6. Hey Little Willow: Leverage! Yes, still knocking me out! 7. I’d heard so much about the horror film Cabin in the Woods that it was atop my horror-film queueueue. I will say only that it was worth the wait. Very gross, true. I wouldn’t give 5 seconds to any of the films it satirizes (the Saw genre, e.g.). But oh my: very surprising and funny: very, very funny. (And btw, he didn’t direct it, but Joss Whedon produced and co-wrote it. Drew Goddard, a Buffy writer, co-wrote and directed Cabin.) The more you think you might be interested in watching it, the more strongly I’d advise you not to seek out details in advance. Including trailers. Oh wow, The Color Book looks gorgeous! Can’t wait to get my hands on it. Thanks for all the celebratory words, jazz hands and spirit fingers, Jules and friends! 1. Getting featured on here again, yay! Thanks for introducing me to Sophie Benini Pietromarch’s gorgeous work. I love the look and the feel of this book! Hi Kate!! So happy to see a sneak peek and can’t wait to see more of your wonderful artwork. my kicks… trees in bloom all over the place and the smells in the air! My 23 year old son got a job offer this week and he is one quarter from graduating, yay! Ditto Kate: good health and good friends and family! Jules- I hope the birthday party/sleepover was a sparkly dream come true! Rachel- Yum!! Lobster mashed potatoes- great date night! Margie- Well wishes for your mom’s continued recovery. Steven- Happy happy birthday month! LW- Lots of things to celebrate in your life this week! kate- Congratulations on your feature! 1) Our presentation went very well- in fact, my professor called it a “master class” for the rest of the class. 2) I’ve gotten to spend this weekend visiting with my brother. 4) I cooked dinner for my family every night this week. 5) My daughter loved that I substituted for her class on Friday. 6) Made it through a difficult week with my son and I think I handled the parenting fairly well. 7) My nephew helped his team win the AAC basketball championship and is headed into March madness again! Rachel, I love that SNL skit. So funny. Also: Ooh la la to great date nights. And I’m going to have to look up what color Platinum Band is. Margie! So good to hear your mom is getting better. RAH! Jone: March Madness Poetry? It sounds delightfully MAD and MADCAP, both good things. Please send updates. Little Willow: DANG, everything is coming up Little Willow, as it should. Always. What good cause? May I ask? Congrats on all your fabulous successes! Kate, I love those last two kicks. Also, I saw some cherry blossoms this week too. RAH! again. Toni: Congrats to your son! Yowza – I love color so ‘you had me at hello’. 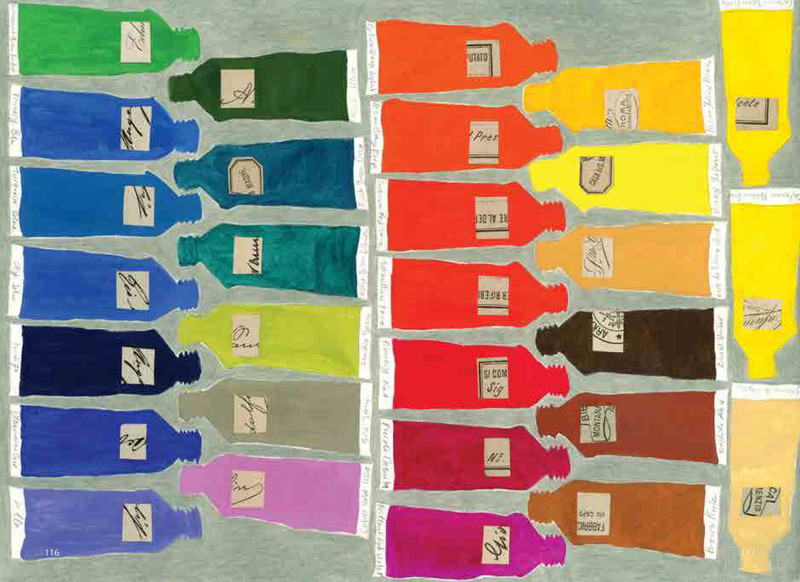 That first image of all the paint tubes – fabulous! Thank you, thank you for introducing us to this book. Can’t wait, like someone else said, to get my hands on it. 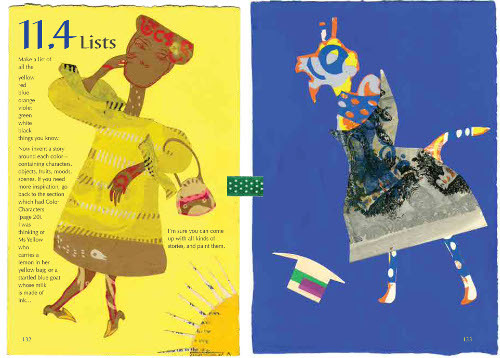 Also, GREAT news about Kate B. agent signing business and LOVE the included illustrations. Love the kicks. 7-Imp Kickers really have it goin’ on this week!!! Jules – hope the party was fun, and I guess surgery went well. Steven – another brilliant poem, thanks! And many happy returns! Glad to hear there is some enjoyment of flower blossoms somewhere in the winterly climes! My heart and thoughts are with the rest of you in the snowy and cold parts of the country! I looked up the color platinum band, I had the same thought as Jules. Good color – very good, better than platinum jewelry in my humble opinion. My congrats to the Master Class compliment, Shannon! Little Willow is rolling! Awesome. Congrats to the March Madness Nephew! 1. gorgeous weather here in LA this weekend (sorry everyone in colder climes!). 2. pulled our Little’s sandbox out for Tiny and she loved it. (Little is now 7, Tiny is one) Seeing her face as she played and felt the sand and crawled in and out of the purple dinosaur sandbox was unforgettable. 3. Baseball spring training has started – phew! I am worn out by LA’s obsession with the Lakers and needed some Red Sox action. 4. Am about to crack open the new VI Warshawski novel by Sara Paretsky. What a writer! What a researcher! What a writer! oh, moving on to Kick 5. 5. Sharing picture book biographies on awesome women with my Little’s 1st grade teacher during Women’s History Month, and getting to read some to his class in the library each week. Oh the riches. 6. Taking The Tree Lady by by H. Joseph Hopkins, illustrated gorgeously by Jill McElmurry to San Diego as a thank you gift while we visit a very dear friend from NH. My Little is excited to go on a tree hunt to find all the species of trees from the book and to see Balboa Park again. 7. Researching books for my voraciously reading 5-year old niece. Hope the party was great fun, Jules! Congrats on the painting, Rachel, it sounds like you prepared well for the process though with your pizza, friend and beer 🙂 And lobster mashed potato…I’ve never thought of such a thing but want it now! Shannon I’m glad you recognise a tough parenting week and appreciate yourself! Allison your Tiny is one?! Wow! Love that she is enjoying the sandbox, I like it when babies are obsessed with texture (and eating sand). John I hoped you enjoyed some “Chinese” takeout with your fun movie viewing! I thought that one was funny too (though still a bit gruesome at times). Allison, the surgery is actually this week, but thanks for the well-wishes. I’m so glad it went so well, sharing your PB biographies. The Tree Lady is one great book. Hi, Emmaco! Here’s to more long naps this week so that you can get some breaks, some rest, some moments to yourself. Margie – that full moon after midnight sounds romantic, glad your mom is recovering. Jone – yes, loved the sunshine while it lasted! Hope you had a great weekend with the grandgirl! LW – congrats on all the successes! Sounds like a great week! Hi John! – happy travels! I’ll have to check out that movie. Kate – hooray for cherry blossoms & feast’s cooked for you! Toni – yay spring and congrats to your son on the job! Shannon – hooray for rocking the presentation! And congrats to your nephew! Allison – hope your Tiny let’s you get more sleep this week. Love the image of the 2 kids playing in the sandbox – so fun. And I’m with you, I love baseball season. emmaco – long naps are wonderful, hope you have a lovely trip! Emmaco , Shannon and Jules – Lobster mashed potatoes – Made of russets, lobster meat and stock, heavy cream, butter, paprika and a pinch of white pepper. I could only find the ingredients and not the precise recipe, but not at all surprised by the heavy cream component – they were so ridiculously rich and yummy! Another round of good, healthy vibes for surgery, Jules! Happy St. Patrick’s Day, imps! Rachel, it sounds like a fun project, painting the whole house. I fear it would take me for-flippin’-ever. Laura, love that book too!